Ensure ongoing inspections to reduce and / or eliminate fire hazards. 2. Provide departmental training, to an accepted standard, which will ensure the continuous upgrading of all personnel in the latest techniques of fire prevention, firefighting and control of emergency situations and ensure the safety of department members and the public. 3. Provide a maintenance program to ensure all fire protection apparatus and equipment is ready to respond to emergency calls. 4. Develop and maintain an effective public information system and educational program with particular emphasis on school fire safety programs; and commercial, industrial and institutional staff training. There are 24 regular scheduled training session held at the Fire Hall annually. They commence at 1900 hours on the 1st and 3rd Tuesday of each month. The Atikokan Fire Rescue Service trains to the standards as outlined in the Ontario Fire Services Curriculum. A considerable amount of training occurs on weekends and in other communities. 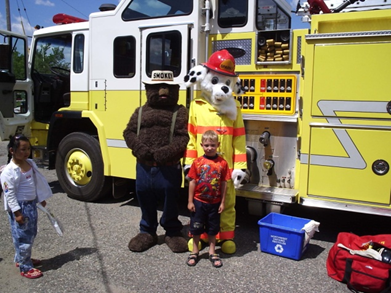 Atikokan Fire Rescue provides essential emergency to the public, essential fire prevention, investigation and education. They implement Disaster and Emergency measurers planning, pre fire planning and training, develop and implement community based programming as well as many others. As a part of Fire Prevention Week they hold an open house at the fire department for all the public to attend, and of course Sparky the fire dog.